Goodreads: Walk down any street, stroll through any park, step into a bar or restaurant, and everyone is glued to their mobile devices. Many of us struggle with the near-constant urge to check our phones—the average person interacts with their device more than 2,600 times a day—and this dependence is affecting our relationships, our work, and our quality of life. It seems the technology that was supposed to connect us has tipped us in the other direction, creating unnecessary stress and distance in our lives. 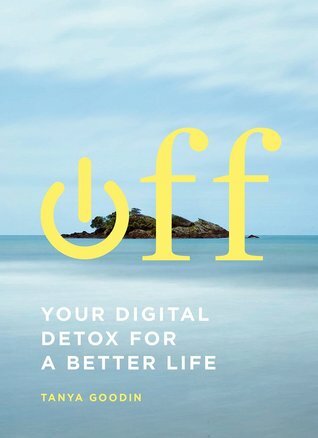 Off: Your Digital Detox for a Better Life isn’t about reverting to a tech-free way of life—it’s about balance. Digital entrepreneur Tanya Goodin offers a guide that will free up hours of your time and lead you back to the pastimes (and people) you love. Learn to cultivate a healthier relationship with your digital devices by adopting simple practices that encourage mindfulness, deeper connection to others, more restful sleep, and increased creativity. Illustrated with serene and inspiring photography, Off will help you free yourself from technology and be more present in your own life. Kritters Thoughts: A short and sweet little book that makes you stop and take a minute and reevaluate your habits. With beautiful photos it was easy to sit down with this book and take a minute and sink in and really read it simply for what it is. Although none of the tips were things that I hadn't heard of before, reading them in a book took more meaning than in an article online and made me stop and take note of how often I am on my phone. I think with everything in life it is good to have boundaries and limits and this little book reminded me that everything is good in moderation! I kept this book to get it out every so often and remind me to take a breather from all things electronic and enjoy a view!